Like our last Disney trip back in 2016, our first day at Disney World was spent at Animal Kingdom. We were there the week Hurricane Michael was coming through and while the Orlando area didn't get directly hit, we did have to deal with rain bands the first few days we were there, yay. The day we were at Animal Kingdom happened to be the day it was open for extra magic hours, but we didn't get there right as they opened so it was already a little crazy. Our fast passes were later in the day so we first headed to Dinosaurland so the kids could ride Triceratop Spin. Then Ewan and I waited for what seemed like forever to ride Primeval Whirl while Alan took Cecily and Cameron to play in The Boneyard, which is a playground. Once we all met back up, we did rider swap for Dinosaur, although the line was still pretty long so I waited with Cameron for probably an hour then rode it with Ewan since Cecily didn't like it that much. Ewan loved it. 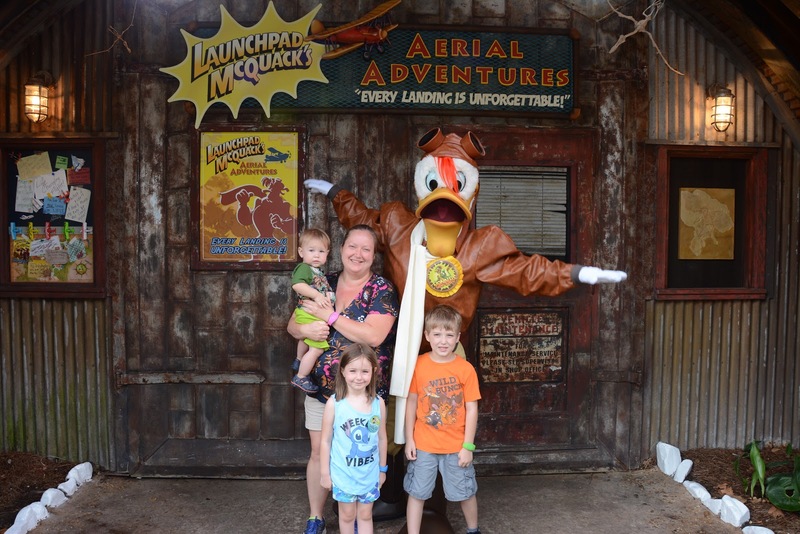 I can't remember if it was before Dinosaur or after, but we saw that Launchpad from Duck Tales was out so we met him. Scrooge was also out but the line was crazy and our fast pass for Kilamangaro Safaris was ready so we couldn't really wait. Animal Kingdom is my favorite park because it's basically a zoo and theme park all in one and my favorite ride here is the safari. It started raining while we were in the truck and we got to see all kinds of animals. My favorite was the baby elephants swimming. So cute! We were on our way to get some lunch when we saw that Timon was out and Ewan wanted to meet him. After lunch we went over to check out Pandora and use our fast pass for the Na'vi River Cruise. It was really cool, but there was no way I would wait over two hours in line, which was the standard wait when we rode it. Nope, nope, nope! Pandora was a really cool place to wander around. It was early October and still super hot so the kids and I all enjoyed a glowing frozen drink to cool off and rested our tired legs for a bit before we walked over to Adventures Outpost to meet Mickey and Minnie. We weren't sure how Cameron would do meeting the characters but he loved Mickey and just wanted to boop his nose. I figured he would cry so it was a nice surprise! Afterwards, we caught the last Festival of the Lion King show of the day. The last time we were here, we saw the Finding Nemo show and Lion King is SO much better. I will admit that I was a little teary-eyed at it all. After the show we just wandered around the shops, killing time until we could use our last fast pass for the Rivers of Light evening show. I was really excited that Animal Kingdom has an evening show since it wasn't around when we went before. However, I was a little disappointed. I don't know if it was because we had grumpy kids or what but it just didn't live up to the extravagance of Disney in my opinion. When we were walking back to the park entrance afterwards, it started thundering. And before we could get the stroller cover on and get to an overhang, woosh! the sky opened up. Alan and Ewan ran for cover and I gave Cecily my phone and told her to keep it dry while I finished getting the cover on the stroller for her and Cameron. I got totally soaked. It was kind of comical, like the park was like ok, get out! 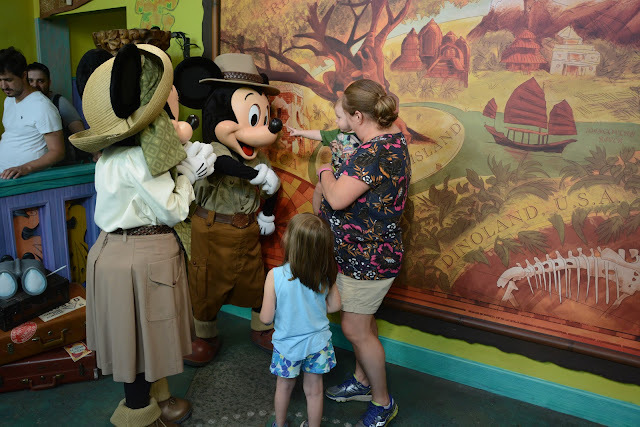 There are a lot of characters you can meet at Animal Kingdom and more things to do, but we focused on the things we didn't do and characters we didn't meet last time. It's probably still my favorite park but I can see how once you've done everything at least once why people say it's a half day park. Still great though!